Expectation vs Reality with a unicorn horn highlighter from Too Faced. Hello there! Highlighters, highlighters… It feels as though they’ll kick me out from my own house soon. 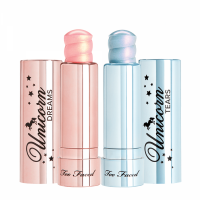 :) So, without any other further ado meet the Too Faced Unicorn Horn Highlighting Stick. The legendary Chocolate Bar Eyeshadow Palette: Does a layman need it? Swatches with and without a base. What base to use with + makeup look. There is something about it, but the cons outweigh the pros.